Arizona's governor is deploying 225 members of the state National Guard to the U.S.-Mexico border on Monday, becoming the second state to heed President Donald Trump's call for reinforcement. "Your mission is to support the efforts of the U.S. Department of Homeland Security and their efforts to secure the border, and keep the communities on the border safe," Gov. Doug Ducey, R-Ariz., told the troops in a press conference Monday. "Your efforts will make every Arizonan and our country safer," he added. Additional troops will be deployed on Tuesday, Ducey said in a tweet earlier Monday. 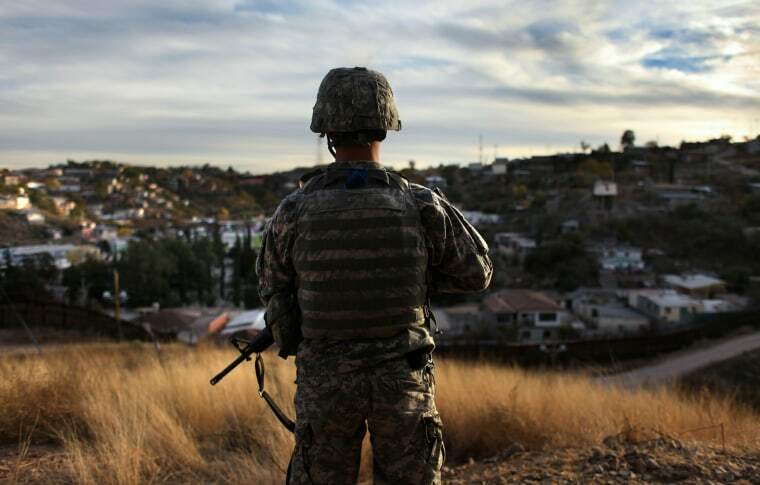 The move comes after Trump last week proposed sending 2,000 to 4,000 National Guard members to the border to curb the flow of undocumented immigrants, after his plans for building a wall stalled. "Until we can have a wall and proper security, we are going to be guarding our border with the military," Trump said. The White House issued a statement that Trump had signed the proclamation Wednesday. The announcement reportedly came as a surprise to many of Trump's advisers. Texas has also responded to Trump's request, offering to send 250 National Guard members to the border. The first batch was deployed by helicopter last Friday. On Friday, Defense Secretary James Mattis approved paying for up to 4,000 troops along the border through the end of September. The Pentagon memo he signed states that the troops will be armed only if needed for self-defense, and says the troops will not be used for law enforcement functions or interaction with immigrants unless Mattis approves it. Ducey saw the Arizona troops off at 11:30 a.m. PT (2:30 p.m. ET) from the Papago Park Military Reservation in Phoenix, shaking hands with each member and thanking them. "I want to thank you for your service to our country, and may God bless you and keep you safe on this mission," he said.